The final, peer-reviewed version of this paper has been accepted for publication in BJUI. Social media has also become very popular amongst healthcare professionals both on a personal and professional basis. The reach and engagement which social media enables, along with the incredible speed with which information is disseminated, clearly creates opportunities for advances in healthcare communication. However, because healthcare professionals also have serious professional responsibilities which extend to their communication with others, there are dangers lurking in social media due to the inherent lack of privacy and control. As a result, major professional bodies have now issued guidance for their members regarding their behaviour using social media. These include bodies representing medical students, general practitioners, physicians, oncologists, the wider medical community, as well as major regulatory bodies such as the Federation of State Medical Boards and the General Medical Council (GMC) in the UK, whose role is to licence medical practitioners. The guidance from the latter, part of the GMC’s Good Medical Practice policy, has significant implications as failure to comply with this guidance could impact a doctor’s licence to practice. All health care providers engaging in social media need to familiarize themselves with the relevant institutional, local, and national guidelines and policies. There are many examples of healthcare providers who have faced disciplinary action following content posted on social media platforms. For example, posting photos of a drunk patient to Instagram and Facebook  is likely to result in serious disciplinary and legal action. In another case, a doctor in the USA was dismissed from her hospital and censured by the State Medical Board when she posted online details of a trauma patient . Although her posting did not reveal the patient’s name, enough information was posted for others in the community to identify the patient. Furthermore, a review of physician violations of online professionalism and disciplinary action taken by State Medical Boards in the USA demonstrated that this case was not isolated . Over 90% of State Medical Boards reported that at least one of several online professionalism violations had been reported to each of them. The most common violations were inappropriate patient communication online, often of a sexual nature. While the most frequent plaintiffs were patients and their families, it is noteworthy that complaints by other physicians were reported in half of State Medical Boards. Overall, serious disciplinary action including licence restriction, suspension or revocation occurred in over half of cases. There is clearly a need for healthcare professionals to be aware of their responsibility when communicating online. So what of urology and social media? There is no doubt that many urologists have embraced social media with great enthusiasm, and urology has been one of the specialties leading the way [4-7]. The BJUI has been at the forefront of this enthusiasm as we have implemented a wide-ranging and evolving social media strategy including an active presence on the main social media platforms, a popular blog site, and a strategy to integrate our journal content across these platforms . We now also recognise achievements in social media in urology through our annual Social Media Awards and by introducing a formal teaching course at the 2013 British Association of Urological Surgeons (BAUS) Annual Meeting, the first such course at a major urology meeting. 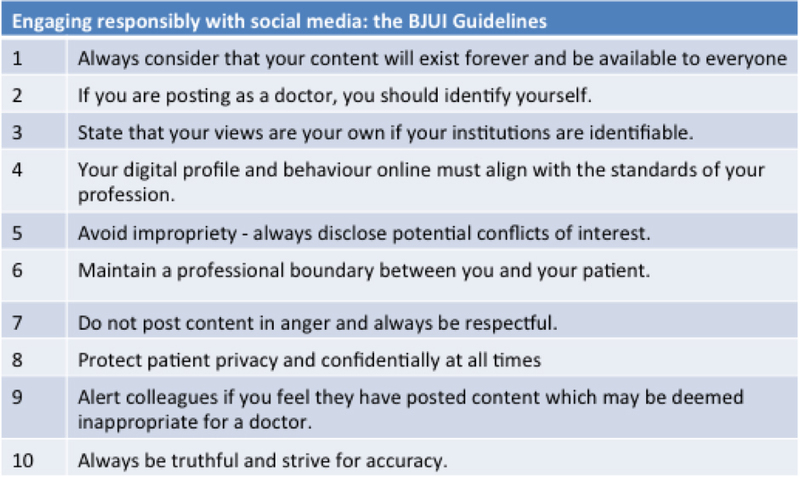 While continuing to encourage the development of social media in urology as one of our key strategies, we also recognise that there are risks inherent in engaging in social media and that clinicians must be aware of these risks. We therefore propose the following guidelines for healthcare professionals to ensure responsible engagement with social media. Much of this content is in alignment with advice issued by the other bodies listed above. Always consider that your content will exist forever and be available to everyone. Although some social media platforms have privacy settings, these are not foolproof and one should never presume that a post on a social media platform will remain private. It should instead be assumed that all social media platforms lack privacy and that content will exist forever. If you are posting as a doctor, you should identify yourself. The GMC guidance has specifically commented on anonymity. They advise that if you are identifying yourself as a doctor then you should also give your name, as a certain level of trust is given to advice from a doctor. People posting anonymously should be very careful in this regard as content could always be traced back to its origins, particularly if it became a matter for complaint. State that your views are your own if your institutions are identifiable. It is commonplace for clinicians to identify their institutional affiliation in their social media profile. While not an excuse for unprofessional activity, it is good practice to state that your views are your own, particularly if you occupy leadership positions within that institution. Your digital profile and behaviour online must align with the standards of your profession. Whatever standards are expected of the licencing body for your profession must be upheld in all communications online. You should also be aware that what you post, even in a perceived personal environment such as Facebook, is potentially accessible by your employers. As employers they will have a certain standard of behaviour that they expect. For example, use of inappropriate language or images of drunkenness could result in disciplinary action. Avoid impropriety – always disclose potential conflicts of interest. The American Society of Clinical Oncology (ASCO) includes this important point in their guidance. Influencers in social media can hold powerful sway and clinicians have a responsibility to use this influence responsibly and manage any potential conflicts. Maintain a professional boundary between you and your patient. It is not unusual for patients to be interested in their doctor’s social network. While most people do not restrict their Twitter followers (and therefore all tweets must uphold professional standards), it is reasonable to politely decline a friend request on Facebook by stating that you keep your personal and professional social networks separate. The BMA guidance specifically advises against patients and doctors becoming friends on Facebook and advises that they politely refuse giving the reasons why. Do not post content in anger and always be respectful. It is considered inappropriate to post personal or derogatory comments about patients OR colleagues in public. Defamation law could apply to any comment made in the public domain. Protect patient privacy and confidentially at all times. There is an ethical and legal duty to protect patient confidentiality at all times, and this equally applies to online communication including social media. If posting a video or image, consent needs to be obtained for this even if the patient is not directly identifiable. Content within a post or image, including its date and location and your own identity, may indirectly identify a patient to others. The GMC guidance also states that you must not ‘discuss individual patients or their care with those patients or anyone else’. Thus posting about a case you have just seen could be in breach of these recommendations. Alert colleagues if you feel they have posted content which may be deemed inappropriate for a doctor. Quite unintentionally, colleagues may post content which may be regarded as unprofessional for any of the reasons listed above. Although a digital shadow may always persist, deleting the online content before it becomes more widely disseminated may help mitigate the damage. Always be truthful and strive for accuracy. All online content in social media should be considered permanent. It should also be considered that anyone in the world could potentially access this content. Therefore, truthfulness and accuracy are simple standards which should be upheld as much as possible. Social media is a very exciting area of digital communication and is full of opportunities for clinicians to engage, to educate and to be educated. However, risks exist and an understanding of the boundaries of professional responsibility is required to avoid potential problems. Adherence to simple guidelines such as those proposed here may help clinicians achieve these aims. Above the Law. ER doc forgets patient info is private, gets fired for facebook overshare. Available at: https://abovethelaw.com/2011/04/er-doc-forgets-patient-info-is-private-gets-fired-for-facebook-overshare/. Greysen SR, Chretien KC, Kind T, Young A, Gross CP. Physician violations of online professionalism and disciplinary actions: a national survey of state medical boards. JAMA 2012; 307: 1141-1142. Please do not ignore these 10 commandments!